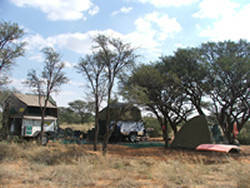 A very popular facility at Soetvlakte is Gemsbok camp. A facility aimed at the tourist who prefers to camp with a caravan, tent or just sleep under the open sky, next to a fire. This is a Kalahari experience with the luxury of warm showers and flushes toilets, ala Soetvlakte style, and right in the veldt. 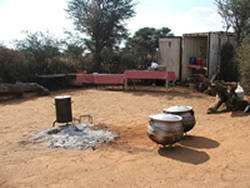 A kitchen equipped with a fridge, a freezer, a microwave and kitchenware for 30 people, allow travellers to spend a night or more without unpacking. We provide firewood and will clean the kitchen once per day. 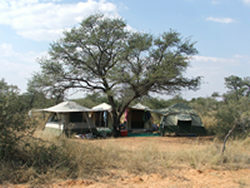 Electricity is available at the centre point to recharge a fridge or freezer or even for electric curlers in the bush. 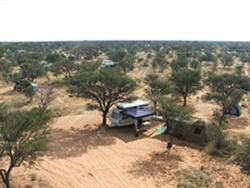 Our target group with this camp is for the camper or people on their way from or to Kgalagadi NP or Botswana.